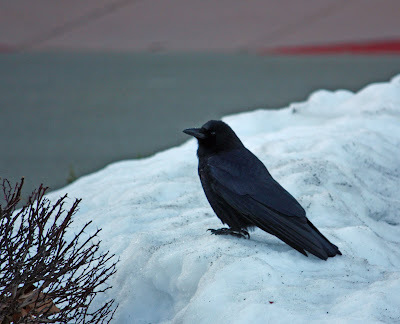 A crow playing in the snow. Several of them were chasing each other around to win position at the top of this melting pile of snow in a story parking lot yesterday. he can have the snow pile, give me a fire. Love this shot, right down to his black button eye. He's quite the bird! I have heard that crows are very intelligent. I like the contrast of the black bird against the white snow.